People nowadays are so busy that when we have good feelings about others, we might not take the time to give a compliment or even think about it. 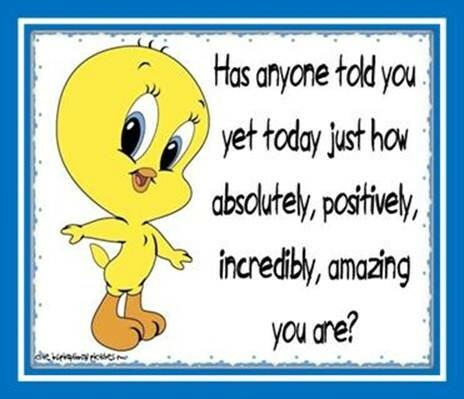 So I decided to post this word-art image for Nurturing Thursday and share a bit of cheerful encouragement! Wishing everyone an amazing day full of joys and successes—and as for the people in your life who make you happy, it doesn’t take much time to give them compliments and spread some good cheer around! Well, THANK YOU …. I feel alive and I have a smile on my face. 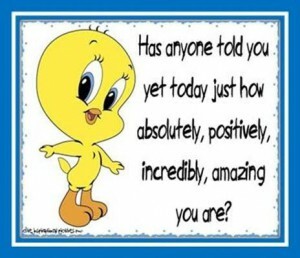 The tweety bird is so cute. I used to watch the cartoon. I’d like to say – The same to you. So glad the post gave you a smile — thanks for commenting to let me know! Wonderful message. I wish you a a very happy weekend. I hope your weekend is great too, Rupali! Awwww Elizabeth — look in the mirror and say it to yourself a few times!